Although not an actual island, this site locally known as “Beer Can Island” encompasses the north tip of Longboat Key. Park at the west end of Broadway St. and follow the short boardwalk to the beach. 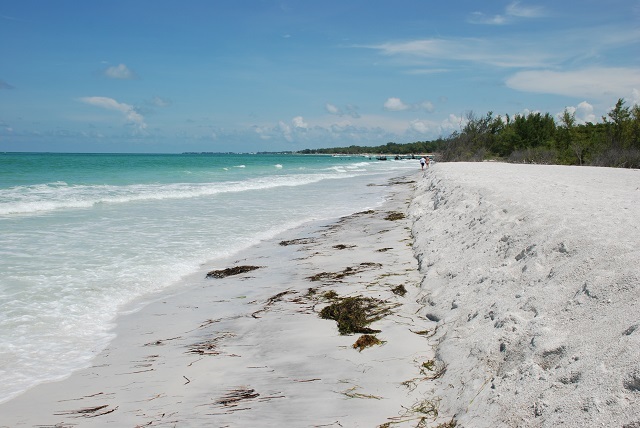 Although the tip was once accessible only at low tide, the beach has been renourished, and now visitors can walk northward all the way to the Longboat Key bridge. Black Skimmers, Willets, Red Knots, Black-bellied Plovers and American Oystercatchers winter on the sandy beach here, sometimes in large numbers. Sanderlings and Ruddy Turnstones are present all year. Snowy and Wilson’s Plovers show up here on occasion, and a few Northern Gannets, Piping Plovers, Whimbrels and Marbled Godwits stop by in winter. Magnificent Frigatebirds soar overhead, so don’t forget to look up. Snowy Egrets and Great Blue Herons often perch on upturned dead trees and driftwood piles along the beach. At the north end, check the sound side for Roseate Spoonbills and Reddish Egrets. As you walk along, scan the mangroves on your right; they provide shelter for migrating songbirds like Prothonotary and Magnolia Warblers especially in September and October. A few sea turtles nest in the dunes during summer. This site is extremely popular with beachgoers and boaters.